This is a high quality Benchmark Street vendor popcorn machine made of the best materials available. You cannot compare the quality of this machine to some of the cheaper ones made with lesser quality materials. Its a solid, good looking, well built commercial popcorn machine!! The 6 oz machine weight is 70 lbs. Sure to create a fun and friendly atmosphere in any location, these commercial quality machines are available as a counter-top model or with the matching trolley. Available in three sizes: 4, 6, or 8 ounce kettles. Easy to use and Maintain. 21w x 18d x 34h. 38w x 23d x 33h. Quarts per hour based upon a 40:1 expansion ratio on popcorn. Dimensions of a Popper on a Trolley: 23d x 38w x 67h. All Poppers ETL tested to standards: UL 197 (9th Edition), NSF 4, and CSA C22.2 NO 109 (M1981). 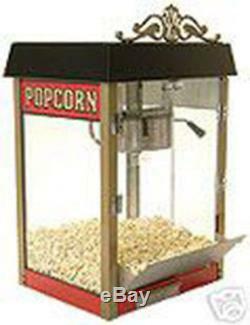 The item "POPCORN MACHINE POPPER BENCHMARK STREET VENDOR 6 11060" is in sale since Friday, December 26, 2008. This item is in the category "Business & Industrial\Restaurant & Food Service\Vending & Tabletop Concessions\Tabletop Concession Machines\Popcorn". The seller is "concessionobsession" and is located in USA. This item can be shipped worldwide.